SNCC leader John Lewis cringes as a state trooper swings a billy club at Lewis’s head during the first attempted march from Selma to Montgomery on March 7, 1965. Lewis escaped and was later admitted to a local hospital with a skull fracture. UPI telephoto, photographer unknown. Image courtesy of the Library of Congress, Prints and Photographs Division. 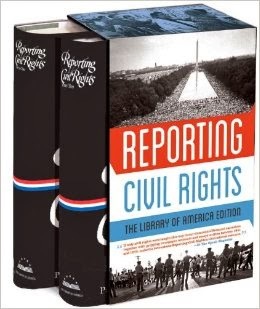 This month (March 2015) marks the fiftieth anniversary of the three historic civil rights marches in Selma, Alabama. At the beginning of 1965 the Southern Christian Leadership Conference threw its support behind a voter registration campaign in Dallas County, where Selma is the county seat. Although the county was 57% black in 1961, only 130 of the 15,000 eligible African American voters were registered. As the campaign ramped up, county sheriff Jim Clark coordinated mass arrests of would-be voters and supporters at the Selma courthouse on January 19, and another 700 people were arrested during a protest march on February 1. During a subsequent demonstration on February 18 in nearby Marion, church deacon and local activist Jimmie Lee Jackson was fatally wounded by a state trooper. In response, SCLC leaders scheduled a 54-mile march from Selma to Montgomery, the state capital. 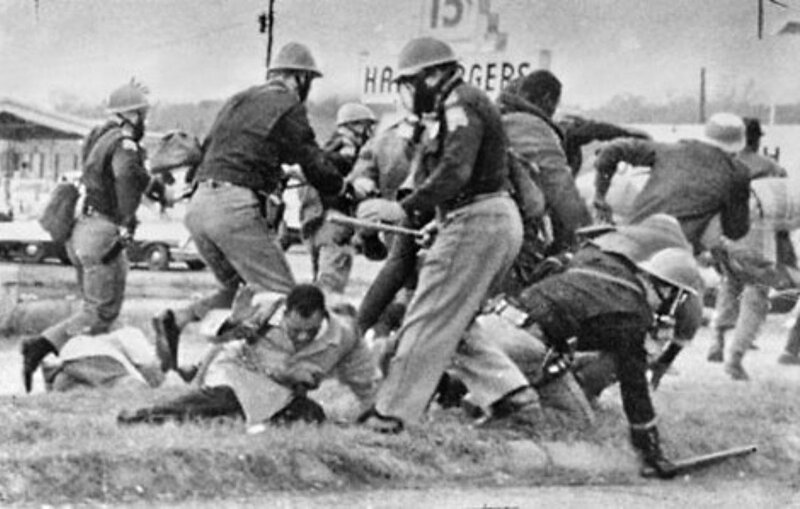 On March 7, as marchers reached the Edmund Pettus Bridge in Selma, they were blocked by state police and sheriff’s deputies and several hundred were clubbed and tear-gassed. One of the march’s organizers, John Lewis (today a member of Congress from Georgia), suffered a skull fracture when a state trooper struck him on the head with a billy club. Photographs and news footage of the travesty, which became known as “Bloody Sunday,” circulated across the nation and fueled calls for the federal government to step in. A few days after the second attempted march, the federal judge lifted his restraining order and enjoined state and local authorities from interfering. Led by King, the marchers left Selma on March 21 under federal military protection and arrived four days later outside of the state capitol in Montgomery, where a rally attended by 25,000 people was held. That same night Viola Liuzzo, a civil rights volunteer from Detroit, was shot and killed by Klansmen in nearby Lowndes County. Four men were arrested the next day; one of the men turned out to be an FBI informant and became a witness for the prosecution. The other three were convicted of civil rights violations in a federal trial and sentenced to ten years in prison, but, after one of the suspects died during the state trial, the surviving two were acquitted of the more serious murder charges. In the midst of this chaotic month, Kentucky native and New York Review of Books cofounder Elizabeth Hardwick traveled to Selma and participated in the third march. On the second night of the trek to Montgomery, she wrote the following reflective essay, describing the countryside and its people and admitting that the “intellectual life in New York and the radical life of the Thirties are the worst possible preparation for Alabama at this stage of the Civil Rights movement.” Her essay appeared in the New York Review the following month. Notes: In the opening sentences, Hardwick refers to several characters from William Faulkner’s fiction: the Snopes family, members of which appear in several works; National Guard captain Percy Grimm (incorrectly identified as Peter Grimm), who kills Joe Christmas in Light in August; and Quentin Compton and Miss Rosa Coldfield, from Absalom, Absalom!, the source for the quote “empty hall echoing with sonorous defeated names.” The Hollywood Ten (p. 357) were screenwriters who refused on First Amendment grounds to answer questions about their membership in the Communist party when they were subpoenaed by the House Committee on Un-American Activities in 1947. They were subsequently convicted of contempt of Congress. On page 358 are references to Herzog, a 1964 novel by Saul Bellow and Les Mots, a 1964 autobiography by Jean-Paul Sartre. Billy Eckstine (p. 359) was an African American jazz singer. What a sad countryside it is, the home of the pain of the Confederacy, the birthplace of the White Citizens Council. . . . If you don't see the full selection below, click here (PDF) or click here (Google Docs) to read it—free!